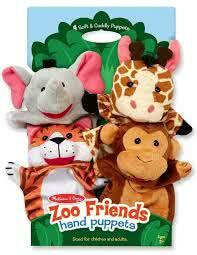 Hand puppets provide a fantastic way for children to engage their imagination and creativity. They get to act out stories they know as well as creating their own and children just love an audience to applaud and appreciate their handiwork. Parents also have the opportunity to use puppets in conjunction with reading stories to their children or dramatising any situation they like. Kids really enjoy it when their parents become melodramatic and act out of character. 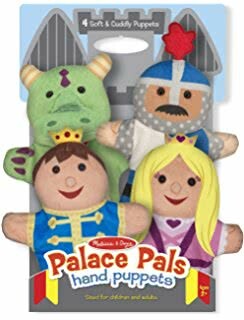 Melissa & Doug provides a wide range of beautiful hand puppets from zoo and farm animals to palace pals, storybook friends and jolly helpers such as the fireman and policeman. There are also puppets that are characters from popular fairy tales and children’s stories such a Little Red Riding Hood. These are puppets that are particularly colourful and are made of a high quality plush fabric providing a lovely soothing sensory experience for children. They are well-sized for the littlest of hands and just big enough for an adult’s hands. They get to make up the roles, the rules, the situations and the solutions. They get to try out different voices. Through imaginative play children come to understand the differences between fantasy and reality. Half the fun of putting on a puppet show is in the planning of the performance and the creation of a stage whether fashioned out of a cardboard box or a large sheet strung between two chairs. Puppets can help children express their feelings and take on different personas such as a good child being a baddie in a story and a shy child taking on the role of warrior or saviour. Children can work out their feelings, fears and frustrations. Children can interact with other children through their puppets and presenting as a group. Children love manipulating the puppets with their hands, making them move in different ways. Puppets also allow for isolated finger movements to make the head move or the arms. Puppets can provide an easier way to communicate valuable messages to children such as good manners and basic rules. Kids have fewer inhibitions when they are speaking through a puppet enabling them to explore different possibilities. It’s wonderful to see children blossom into confident and creative storytellers. Puppets can help them do just that and the extensive Melissa & Doug range of hand puppets provide a wide variety of characters for children to choose from.